Synthetic peptide corresponding to Human Caveolin-1 aa 1-17. WB: Human lung, heart and spleen lysate. Rat heart protein extract. ICC/IF: NIH/3T3 and HeLa cells. Rat astrocytes. 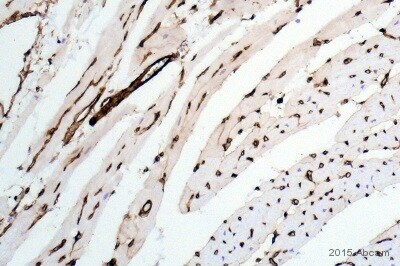 IHC-P: Human cardiac tissue. IP: A549 cell lysate. This antibody can be used as a marker for lipid raft fractions. Our Abpromise guarantee covers the use of ab2910 in the following tested applications. WB Use a concentration of 1 - 2 µg/ml. Detects a band of approximately 22 kDa (predicted molecular weight: 20 kDa).Can be blocked with Human Caveolin-1 peptide (ab4928). Dot Blot - Anti-Caveolin-1 antibody (ab2910)Ferraz-Nogueira et al PLoS One. 2014 Jul 15;9(7):e102526. doi: 10.1371/journal.pone.0102526. eCollection 2014. Fig 1. Structure and characterization of pmPAS, a plasma membrane FRET biosensor for PA. Cells expressing pmPAS were lysed and subjected to sucrose gradient ultracentrifugation to check the localization of pmPAS in subdomains of the plasma membrane. Fractions were probed for caveolin-1 using ab2910. 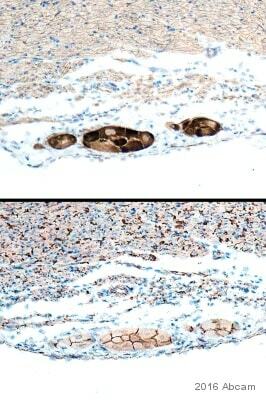 Immunohistochemistry - Anti-Caveolin-1 antibody (ab2910)Vicente et al PLoS One. 2018 Jun 11;13(6):e0198822. doi: 10.1371/journal.pone.0198822. eCollection 2018. Fig 5. Cross-sections of normal human corneas (A, F, K) and naïve ARK corneas (B, G, L), KLAL ARK cornea (C, H, M), centered transplanted ARK cornea (D, I, N) and decentered transplanted ARK cornea (E, J, O) labeled with antibodies (green) against Ki-67 (A-E), CD68 (F-J) and caveolin-1 (ab2910) (K-O). The corneal buttons were routinely formalin-fixed, embedded into paraffin wax and serial sections, 4 μm thick, were collected on Superfrost® Plus slides, dried in a vertical position overnight at 60°C and thereafter stored at +4°C in a tightly closed slide box until further processing. Two normal corneas were processed and sectioned using the same protocol. For full method, please see paper. ab2910 at a 1/250 dilution staining NIH/3T3 (Mouse embryo fibroblast cell line) cells by Immunocytochemistry (panel B). The antibody was incubated with the paraformaldehyde fixed cells for 12 hours. 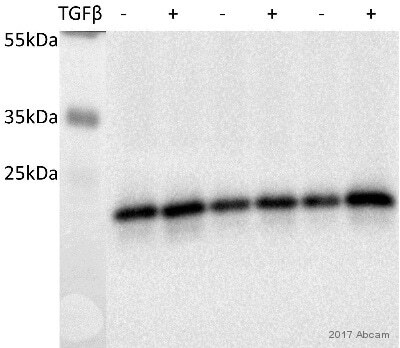 Bound antibody was detected using an Alexa Fluor ® 594 conjugated Goat anti-rabbit antibody (ab150080). 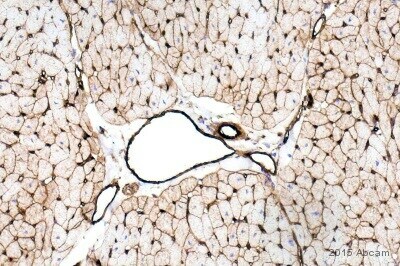 Panel A shows staining with a mouse anti-Caveolin 1 antibody (clone 2297). Panel C shows the merged image. This image is courtesy of an Abreview by William Ackerman. 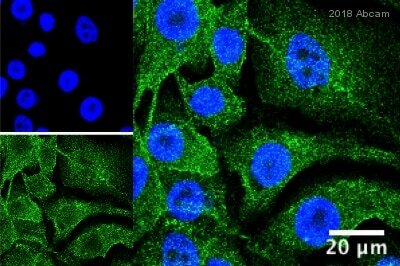 Immunohistochemistry (Formalin/PFA-fixed paraffin-embedded sections) - Anti-Caveolin-1 antibody (ab2910)Image is courtesy of an AbReview submitted by Carl Hobbs. Immunohistochemical analysis of formaldehyde-fixed paraffin-embedded human cardiac tissue, labeling Caveolin 1 with ab2910 at a dilution of 1/10,000 incubated for 2 hours at 21°C in TBS / BSA / Aside solution. Heat mediated antigen retrival was performed with citric acid. Blocking was with 1% BSA incubated for 10 minutes at 21°C. Secondary used was a goat anti-rabbit polyclonal biotin conjugate at 1/300. Image shows strong immunopositivity at the membranes of cardiomyocytes (invaginations of immunostaining show points of branching of each myocyte). There is intense positivity in the smooth muscle of of arterioles. Not seen is the intense positivity of what seems to be the endothelial lining cells of the endocardium. 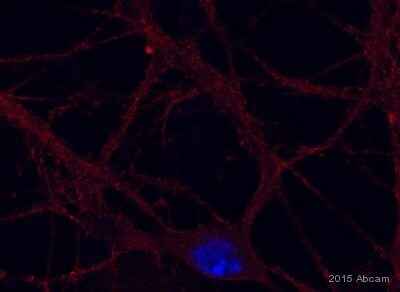 Rat astrocytes stained with fluorescently labeled Caveolin-1 antibody. Primary antibody is ab2910 at a dilution of 1/500 and the secondary antibody is Texas red labeled anti-rabbit IgG at a dilution of 1/1000. This image was kindly supplied as part of the review submitted by Donghui Zhu. 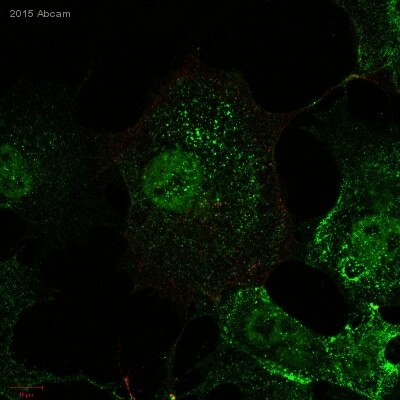 ab2910 staining Caveolin-1 - Caveolae Marker in HeLa (Human epithelial cell line from cervix adenocarcinoma) cells by ICC/IF (Immunocytochemistry/immunofluorescence). Cells were fixed with paraformaldehyde. Samples were incubated with primary antibody (1/200 in PBS + 0.05% Saponin) for 1 hour at 37°C. 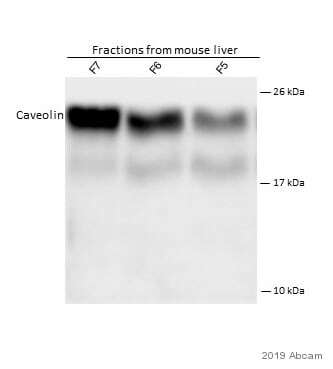 A Cy3®-conjugated Donkey anti-rabbit polyclonal (1/500) was used as the secondary antibody. ab2910 diluted 1/500 and was incubated with A549 (Human lung carcinoma cell line) whole cell lysate and a Protein A/G matrix for 16 hours at 4°C to achieve immunoprecipitation. 400 µg of lysate was present in the input. 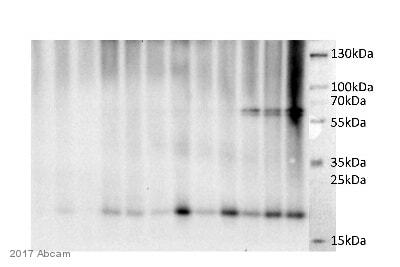 An HRP-conjugated goat anti-rabbit was used for the Western Blot step. Publishing research using ab2910? Please let us know so that we can cite the reference in this datasheet.